Does Promax Lipo as a fat reduction treatment really work? Home » News » Does Promax Lipo as a fat reduction treatment really work? How do I know if this fat reduction treatment really works? There are so many fat reduction treatments on offer and at such widely different prices. How will you know if this is the treatment for you? Understanding the technology behind the process is obviously an important factor when making your decision, as well as hearing about other patients who have been through the process with successful outcomes. Promax Lipo fat reduction treatment is successful based on 3 clinically proven processes to damage the structure of a fat cell, shrink it & tighten the skin. Breaking down the fat cell: Ultrasonic cavitation is delivered through a device which is rubbed over the treatment area. This creates sound energy pulses to damage the fat cell. It targets fat cells only – all other tissue is untouched. The sound pulses create a bubble effect. When the bubbles burst they create a mini ‘shock wave’ on the water in the interstitial fluid. (Interstitial fluid is a solution that surrounds any cell of a multi cellular animal.) This wave hits the fat cell (adipocyte) causing the cell wall to be damaged, releasing triglycerides (the main constituent of body fat) which are then excreted or re-metabolised. So in summary, ultrasonic cavitation shrinks fat cells. Improving lymphatic drainage & circulation: A vacuum is used to help dislodge cell contents further and improve circulation putting extra pressure on the damaged fat cell. Tightening the skin: radio frequency (RF) heats deep layers of the tissue to reduce the fat cells further. It also stimulates collagen and increases blood flow. 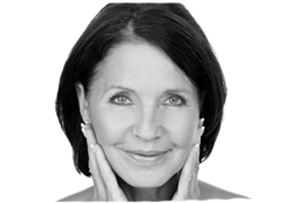 RF is one of the leading procedures for skin tightening in anti-ageing and is used as a procedure in our Signature Facial. What do other patients think about the process? This treatment is one of the most popular within Changes Clinic because it works! It’s ideal for stubborn fatty areas: post baby tummies, male moobs, love handles and below the bra line. 92 out of 100 customer who have had treatment with us are happy with the outcome. However, it will not give you all over weight loss – that’s a weight loss programme such as ProChange. 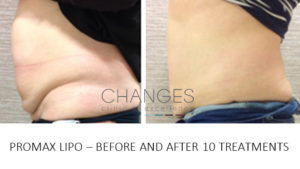 A Promax Lipo session lasts around 45 mins (depending on area) and is £59. However, courses are cheaper (£599 for 12 is the current January offer). Also look out for a combination weight loss programme & Promax Lipo course offer at £399!